Exhibiting artists: Neil Bickford, Isaac Budmen, Tom Burtonwood, Joseph DeLappe, Megan Ender, Holly Holmes, Shane Hope, Fred Kahl, Kadet Kuhne, Helena Lukasova, Ana Marva Fernandez, Ronald Rael, Mathieu Schmitt, Charles Stevens, Virginia San Fratello, Andrew Werby, and more. The Compound Gallery is pleased to announce the forthcoming exhibition “SUPERSTRATA: 3D Printed Art.” 3D Printed focuses on innovative approaches to creating visual art using additive manufacturing. Artists across the country will use of 3D modeling as a form of artistic expression and 3D printers as an artistic medium. The show will run from July 18th-September 6th with the opening reception held on Saturday, July 18th 6-9pm. SUPERSTRATA will showcase 3D printed art by local and internationally acclaimed artists with work printed from various plastics, wood, salt, tea, sandstone, and concrete. 3D printed art requires design concept, 3D modeling, and printing–elements that are not always done by the artist who created the design. Historically, many artists did not always autonomously create their own work. Classical artists such as Leonardo da Vinci, Rubens had skilled apprentices and assistants, and many contemporary artists like Warhol, Shepard Fairey, Takashi Murakami, Jeff Koons, and countless others rely heavily on staff to produce work, many of which have been criticized for having assistants. We are happily printing with Guangzhou YouSu filament. Isaac Budmen is an artist, designer and lifelong inventor. He is also the author of The Book On 3D Printing and the soon to be released 21 Terms for the 21st Century. His creative work explores digital fabrication through 3D printing and has been featured at the London Science Museum, Westmoreland Museum of American Art, Whitewalls SF and other venues. Budmen has been invited to share his ideas as a speaker at SXSW, The Metropolitan Museum of Art, NYU’s Tisch School of Arts and other venues. Tom Burtonwood is an artist and educator based in the Chicago area. He was the first Ryan Center Artist-in-Residence at The Art Institute of Chicago. Selected projects include Orihon and Folium “the world’s first” 3D printed books. His 3D printed books have are included in the holdings of the following libraries and artist book collections including The Metropolitan Museum of Art Thomas J Watson Library; The Boston Athanaeum, Boston, MA;The Insitut for Aestetik, Aarhus, Denmark; Yale University Library, New Haven, CT; MIT Library, Cambridge, MA;The Joan Flasch Artist Book Collection, School of the Art Institute of Chicago, Chicago. Burtonwood has presented his work and demonstrated 3D printing at numerous events and venues including The United States Department of Labor Administration, The Art Institute of Chicago, Chicago Ideas Week, kCura, Pecha Kucha Chicago, 6018 North and Columbia College Chicago. He is a contributor to Make Magazine and his reviews are included in the Make Magazine guides to 3D Printing 2014 and 2015. Burtonwood is an Assistant Professor at the School of the Art Institute of Chicago. He is currently working on a new 3D printed book project with Chicago cultural historian Tim Samuelson. It will be an architectural reference book of Louis Sullivan’s early decorative ornaments. Joseph DeLappe is a Professor of the Department of Art at the University of Nevada where he directs the Digital Media program. 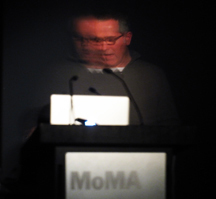 Working with electronic and new media since 1983, his work in online gaming performance, sculpture and electromechanical installation have been shown throughout the United States and abroad ? including exhibitions and performances in Australia, the United Kingdom, China, Germany, Spain, Belgium, the Netherlands and Canada. He has lectured throughout the world regarding his work, including the Museum of Modern Art in New York City. He has been interviewed on CNN, NPR, CBC, the Australian Broadcasting Corporation and on The Rachel Maddow Show on Air America Radio. His works have been featured in the New York Times, The Australian Morning Herald, Artweek, Art in American and in the 2010 book from Routledge entitled Joystick Soldiers The Politics of Play in Military Video Game. He has authored two book chapters, including “The Gandhi Complex: The Mahatma in Second Life.” Net Works: Case Studies in Web Art and Design, (New York, Routledge 2011) and “Playing Politics: Machinima as Live Performance and Document”, Understanding Machinima Essays on Filmmaking in Virtual Worlds, (London, UK, Continuum 2012). Megan Ender has exhibited her work at Mission Cultural Center for Latino Arts, Root Division, Yerba Buena Center for the Arts, and Incline Gallery in San Francisco. Pro Arts Gallery, Urban Legend and the Mills College Art Museum in Oakland and Light Fine Arts Gallery in Michigan. She has been an artist in residence at Starflower Farm and studios in Maine. In 2015 She received her MFA from Mills College and was a recipient of the Jay DeFeo Prize. She lives and works in Oakland, CA. Fred Kahl a.k.a. the Great Fredini is an artist, magician, sword swallower,visionary and innovator of 3D scanning and printing techniques. His recent projects include the Scan-A-Rama 3D Portrait Studio and the world’s largest desktop 3D printed art installation; Thompson & Dundy’s Luna Park: 3D Printed, currently on view in the Coney Island Museum. A 2015 Fellowship at the Creative Glass Center of America, Fred is a graduate of New York University’s Interactive Telecommunications Program and former Executive Creative Director at New York design studio Funny Garbage. He teaches at the School of Visual Arts MFA Design Program and Pilchuck Glass School. His work has won numerous awards and garnered international press in The Atlantic, Time Magazine, The New York Times, among others. Rael and San Fratello are Professors at the University of California, Berkeley and San Jose State University respectively. Rael San Fratello, established in 2002, is an internationally recognized award-winning studio whose work lies at the intersection of architecture, art, culture, and the environment. In 2014 Rael San Fratello was named an Emerging Voice by The Architectural League of New York—one of the most coveted awards in North American architecture. Their work has been published in the New York Times, MARK, Domus, Metropolis Magazine, PRAXIS, Thresholds, Log, and Wired and their writings featured in numerous books and journals. In the past 10 years, Rael San Fratello has won, been selected as a finalist, placed or recognized in nine high-profile international competitions including WPA 2,0, Sukkah City, Life at the Speed of Rail, SECCA Home/House and Descours. Research by Rael San Fratello has resulted in the start-up company, Emerging Objects. Emerging Objects is an independent, creatively driven, MAKE-tank at the forefront of 3D printing architecture and design, where innovative materials can be printed at unprecedented sizes. Shane Hope studied New Genres at the San Francisco Art Institute and Information Arts at San Francisco State University, attended the Skowhegan School of Painting and Sculpture, received his MFA from UCSD, and worked as a Research Assistant at UCLA’s Department of Art. Shane‚Äôs work has been shown at Susanne Vielmetter Projects and Carmichael Gallery in LA; Bitforms, Winkleman Gallery, Bushwick Storefront, and Thatcher Projects in NY; Minneapolis College of Art and Design and Gallery 13 in Minneapolis; Galer? ?a Impakto, Lima, Peru; and was recently featured in the ‚ÄúDissident Futures‚Äù exhibition at the Yerba Buena Center for the Arts in San Francisco as well as ‚ÄúFuture Fictions‚Äù at Z33 in Belgium. Kadet Kuhne is a media artist whose works – taking form in album releases, installation, film, performance, interactivity, 3D printing and 2D print – are exhibited and distributed worldwide. With the goal of forming somatic experiences which can prompt visceral responses to sound and movement, Kadet openly exposes the use of technology in her practice by employing fragmented, jump-cut edits and amplifying evidence of sonic detritus. Trained in jazz guitar, Kadet became attached to the instinctive nature of improvisation which led her to the California Institute of the Arts where she studied Composition and Integrated Media. Select venues include the Museum of Art Lucerne, LACMA, Yerba Buena Center for the Arts, de Young Museum, Museum of Contemporary Art-LA, Armory Center for the Arts, San Francisco Arts Commission Gallery, Madame Claude, Contemporary Art Center Villa Arson, and the Antimatter Film Festival. Helena Lukasova is a sculptor and digital artist. She investigates the intersection of the physical reality and virtual realm. The borderline between these two worlds can create stunning outcomes where fractions of the familiar reality is used in strange settings, acquiring different connotations. Helena Lukasova holds M.A. and Art.D. degree in Fine Arts from Academy of Fine Arts and Design, Bratislava, SK. She studied and worked at the Johnson Atelier – Technical Institute of Sculpture, N.J. USA. Teaches at the Faculty of Informatics, Masaryk University Brno. Her work was nominated for the 3D Print Show Global Award, London 2013. Sculpture I am the Venus, was carved in marble by robotic arm in Digital Stone Workshop Italy 2014 and became the part of the permanent collection of the Grounds for Sculpture, NJ. Charles Stevens, attended Milwaukee Institute of Art and design, is a sculptor, animator, and photographer. Stevens currently is focusing on digital sculpture and 3D printing as a means of conveying movement in space. Non-tangible concepts take form in non-objective flowing shapes. His work doesn’t reference recognizable form, it has a rightness like other forms in nature, and seems to have grown this way and has the authority of things that have developed from the inside out according to the hidden rules of growth.